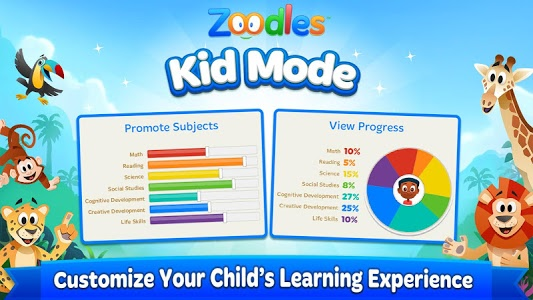 - Zoodles Kid Mode has been redesigned from the ground up! - New look and feel, now with fun animals! 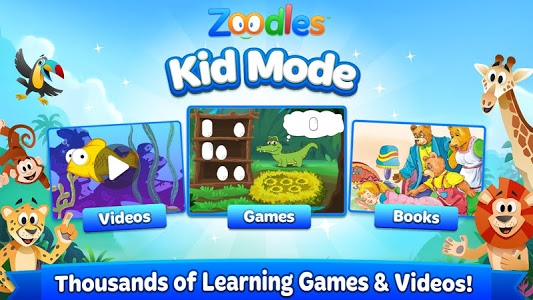 Zoodles® Kid Mode® features the best educational apps, games, books, and videos for your kids, all for FREE! 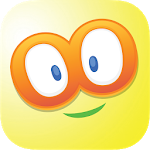 Kid Mode is an award-winning education app that’s designed by parents to help kids learn and play in a safe digital environment. 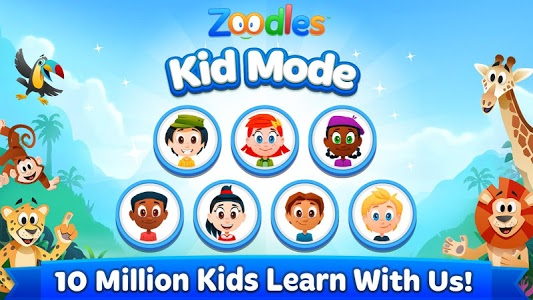 Over 11 Million kids are learning and playing with Kid Mode! Zoodles wants to help put you, the parents, in control of what your kids are doing. Kid Mode measures and displays key aspects of your kid’s learning progress, and enables you to customize the learning experience. You can also set time limits, choose languages, and allow specific apps in our secure digital platform that kids can only leave with your permission. Download Kid Mode Now for FREE! -	Games, Videos, and Books: Kid Mode has the best learning games, videos, and books that help kids of all ages learn and play. -	Curated Educational Content: Education Experts hand pick all educational games and videos to ensure we have the best educational apps for kids. All games and videos map to the US Common Core Curriculum. -	Games and Videos Cover All Educational Subjects: Kid Mode has all the best education games, from ABC to Math Games, Science Games, English Games, Puzzles, and more. -	Videos from the Names you Trust: Kid Mode has videos from the names parents trust, from Sesame Street to Dora, Nickelodeon, and more. We even have videos that help kids learn that Math is fun! -	Customized For Each Kid: Zoodles Recommender Engine helps ensure your kids get the best games and videos for them. You can further customize the experience in the simple Parent Dashboard. 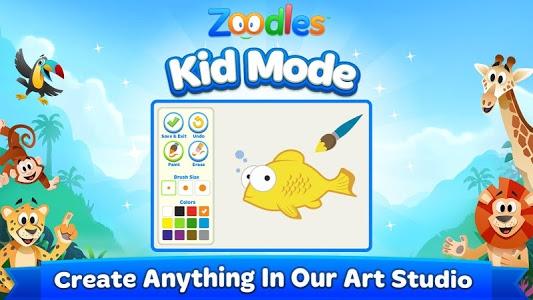 -	Keep Kids Safe: With our Child Lock, your kids can’t leave the safe Kid Mode without your OK.
-	Doodle With Zoodles: Zoodles Art Studio lets your kids doodle, paint, color, and draw. -	See What Your Kids Are Doing: We measure and display key aspects of your kid’s learning progress. -	Parents and Kids Love us: Kid Mode has won numerous parenting awards, and over 11 Million Kids are learning and playing with Kid Mode worldwide! -	Customize the learning experience by promoting specific academic subjects through the intuitive Parent Dashboard. -	Access enhanced parental controls that allow you to set time limits, add safe apps, change languages, and more. -	Unlock the Full Library of Storybooks. 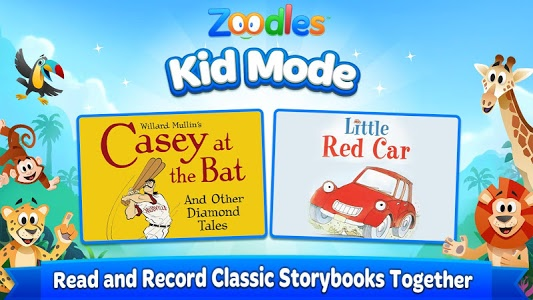 -	Personalize Storybooks with our recordable narration feature. 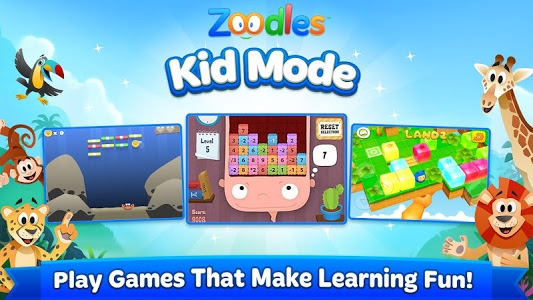 Similar to "Kid Mode: Free Learning Games"